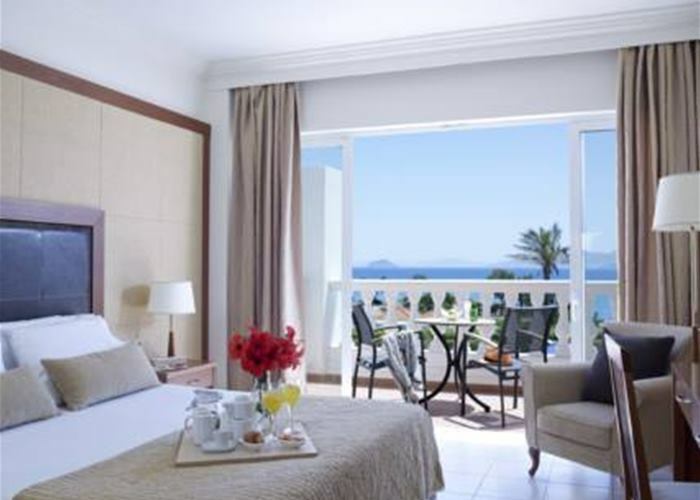 Holidays are special and with that in mind this hotel has been carefully designed to allow every holidaymaker the chance to unwind within an elegant environment. 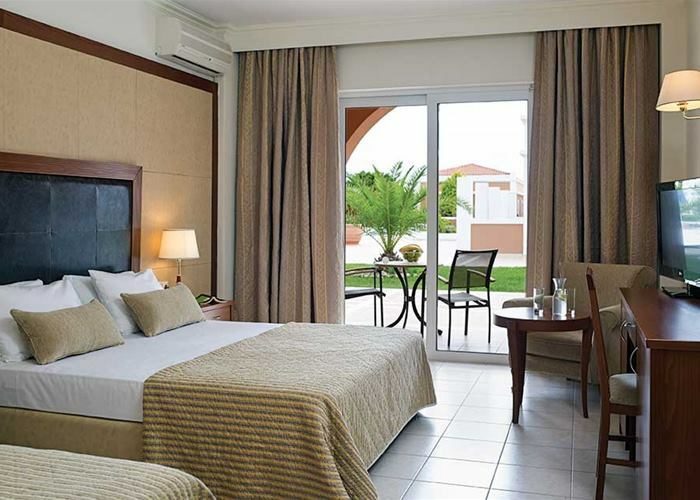 Each of the rooms offer spacious living and surround the thirteen amazing swimming pools. There's a true feeling of style from the minute you enter, with the floor to ceiling windows and if this sounds your kind of place then you will for sure enjoy a pampering session in the hotels spa. Dining is always a time to look forward to with everything from a traditional Greek tavern to Italian delights and if you enjoy a treat or two then head over to Gelateria, offering a taste of the intercontinental flavours for the sweet tooth. 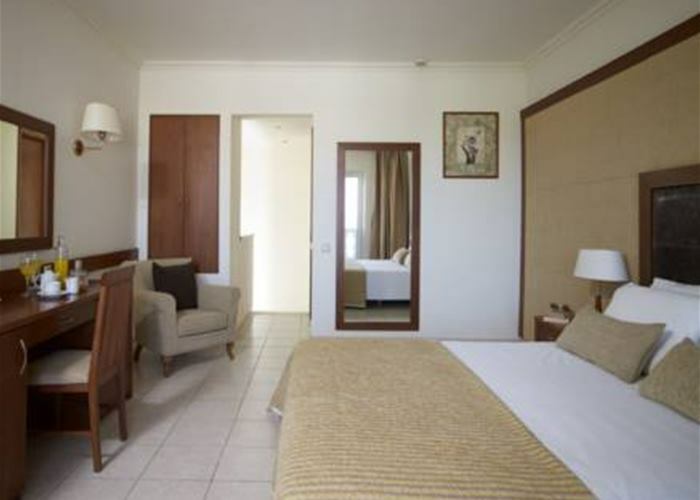 Rooms are spacious with a sophisticated style and sleep up to 3 people. 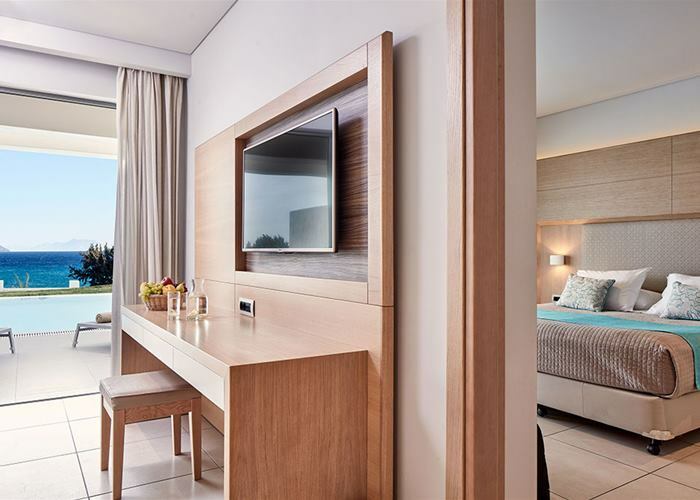 You will find all the holiday essentials like mini fridge, LCD TV and air conditioning making your living space a comfortable environment for your holiday experience. 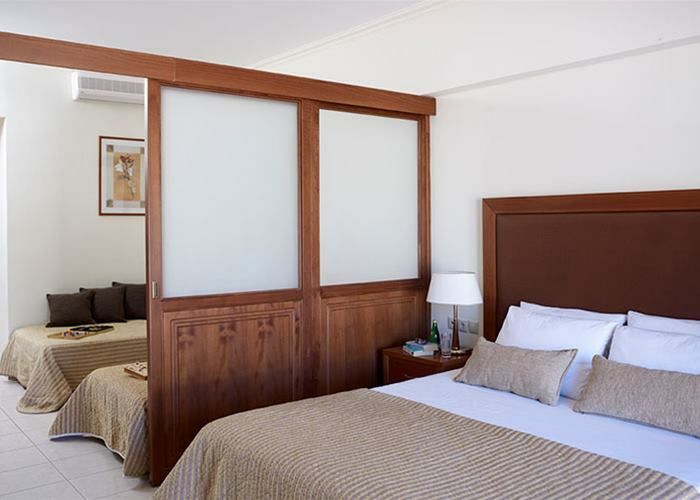 Rooms are spacious with a sophisticated style and sleep up to 3 people. 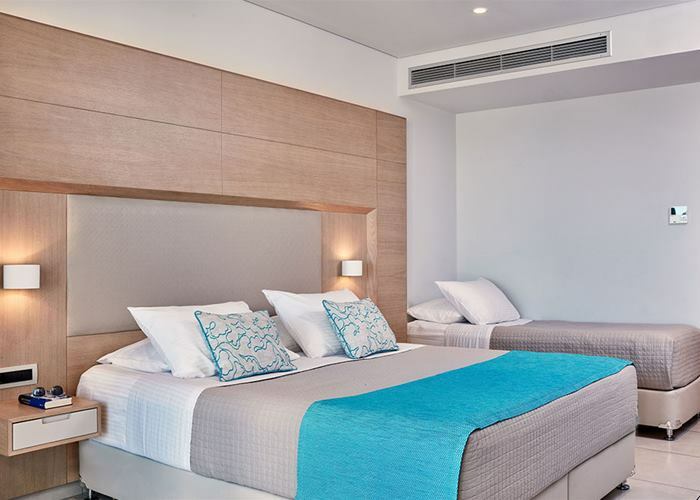 This room has the beauty of a sea view and you will find all the holiday essentials like mini fridge, LCD TV and air conditioning making your living space a comfortable environment for your holiday experience. 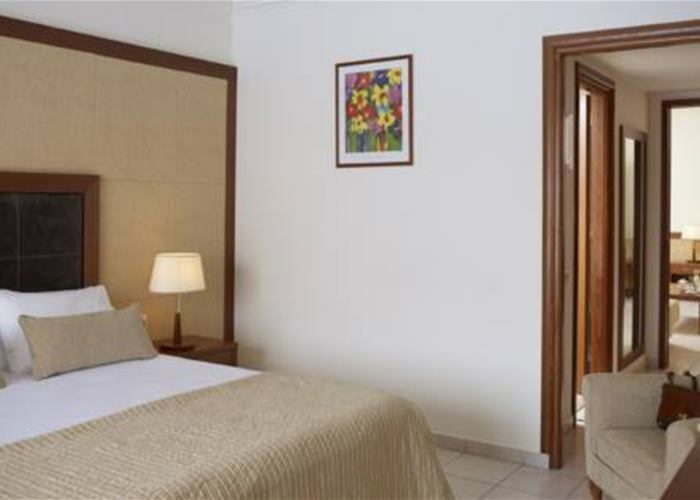 Rooms are spacious with a sophisticated style and sleep up to 3 people. 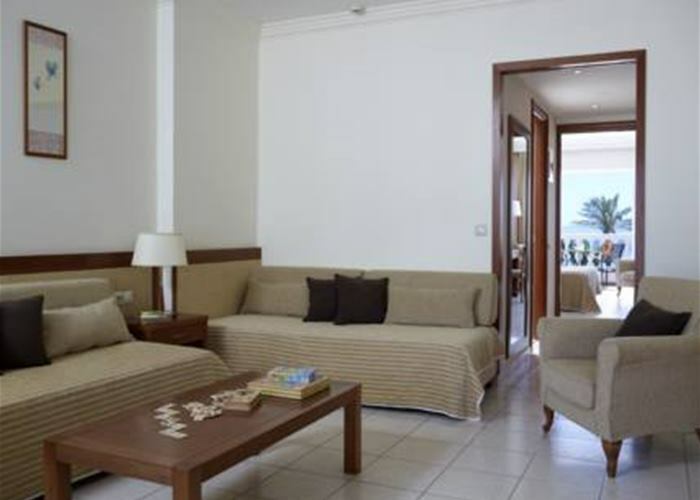 There's a beautiful sea view from the balcony or terrace and you will find all the holiday essentials like mini fridge, LCD TV and air conditioning making your living space a comfortable environment for your holiday experience. These stunning rooms hold a modern design with easy on the eye colours and sleep up 3 people. The large terrace doors open out on to a bathing area complete with sun beds and private pool. There's a beautiful sea view from the terrace and you will find all the holiday essentials like mini fridge, LCD TV and air conditioning making your living space a comfortable environment for your holiday experience. These are the ideal choice for families looking to relax with some privacy. Rooms sleep up to 4 people with a maximum of 3 adults and the two sleeping areas are partially separated with a sliding partition. You will find all the holiday essentials like mini fridge, LCD TV and air conditioning making your living space a comfortable environment for your holiday experience. These room types come with inland view. 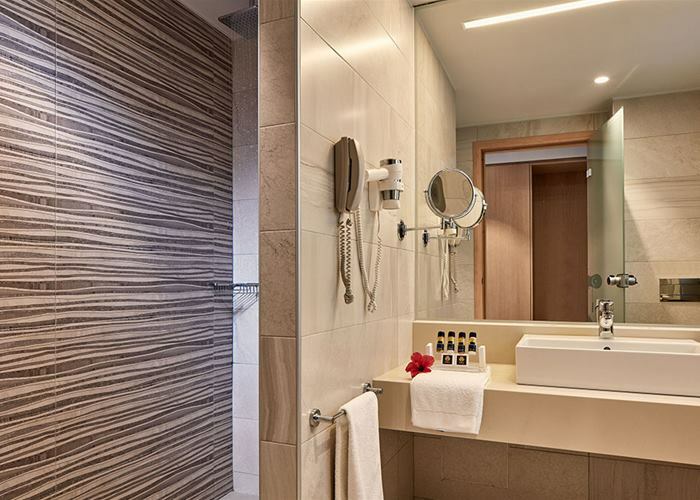 Junior suites offer more than ample space with a clean cut decor and fresh feel. Sleeping up to 4, they accommodate a maximum of 3 adults with a bedroom and lounge area that doubles up in to a sleeping area and is separated by a closing door. Junior suites include a welcome pack stocked with soft refreshments, bathrobes, slippers, mini fridge, LCD TV and air conditioning. Side Sea View also available. 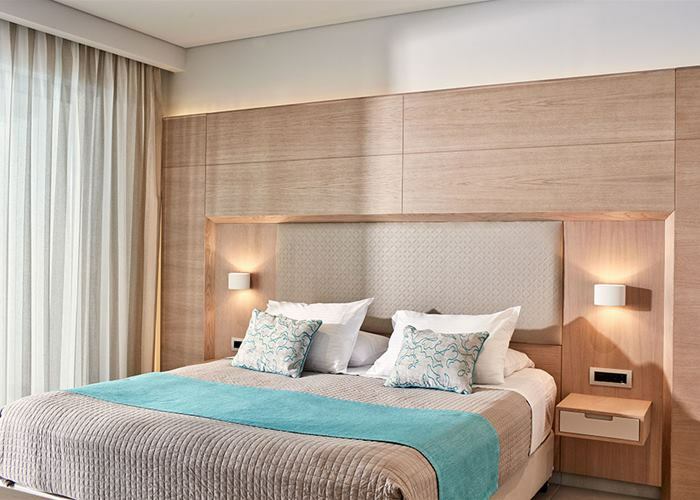 Junior suites offer more than ample space with a clean cut decor and fresh feel. Sleeping up to 4, they accommodate a maximum of 3 adults with a bedroom and lounge area that doubles up in to a sleeping area and is separated by a closing door. 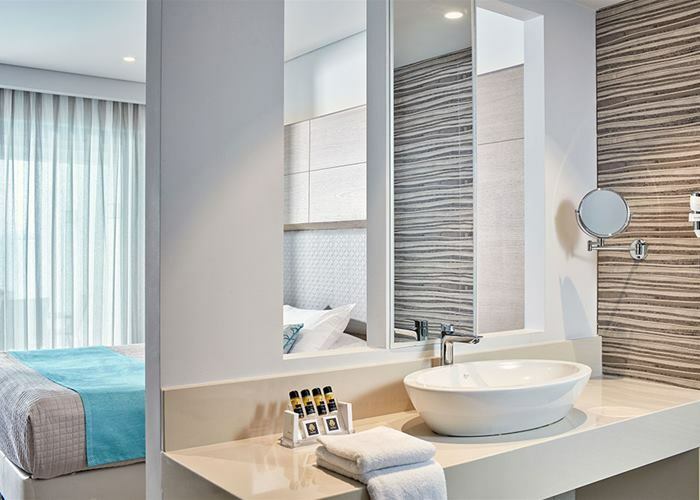 Junior suites include a welcome pack stocked with soft refreshments, bathrobes, slippers, mini fridge, LCD TV and air conditioning. These modern rooms hold natural colours with a spacious living environment and sleep upto 5 people. The additional room doubles up in an area that sleeps up to 5 people when needed and there is an optional choice of a shared pool (by request only). You will find all the holiday essentials like mini fridge, 2 LCD TV's and air-conditioning making your living space a comfortable environment for your holiday experience. 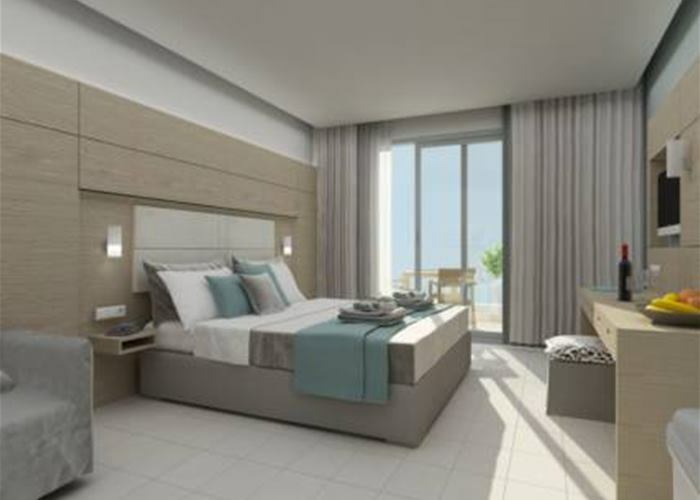 These modern rooms hold natural colours with a spacious living environment and memorable sea view. The additional room doubles up in an area that sleeps up to 5 people when needed and there is an optional choice of a shared pool (by request only). You will find all the holiday essentials like mini fridge, 2 LCD TV's and air-conditioning making your living space a comfortable environment for your holiday experience. 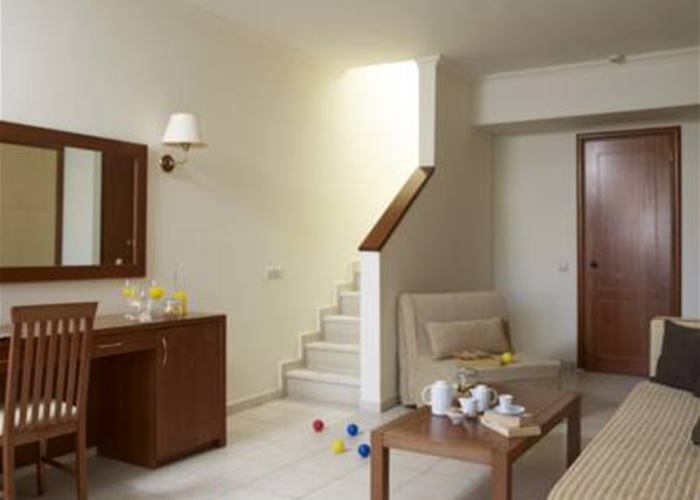 When your room plays a large part of your holiday these suites are the right choice. With a calming decor the suite sleeps up to 4. The large terrace doors open out on to a bathing area complete with sun beds and private pool. There's a beautiful sea view from the terrace and you will find all the holiday essentials like mini fridge, LCD TV and air conditioning making your living space a comfortable environment for your holiday experience. These split level rooms showcase neutral tones and a fresh feel. You'll find a bedroom with bathroom on the 1st floor and a lounge with WC on the ground floor. The lounge doubles up in to a sleeping area allowing this spacious maisonettes to sleep up to 4. 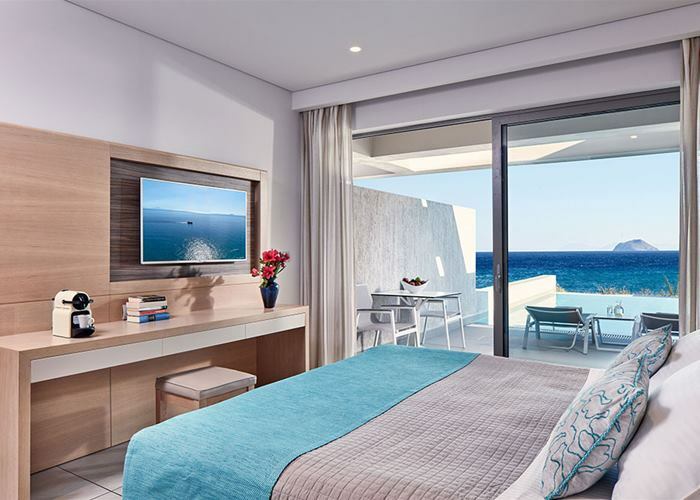 Rooms come complete with balcony and terrace and include a mini fridge that is replenished daily with soft drinks and water, bathrobes, slippers, LCD TV and air-conditioning.